Wonder – A Garden Adventure for All Ages! 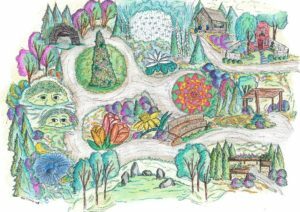 Choosing the theme Wonder – A Garden Adventure for All Ages for the 2019 Vermont Flower Show was an easy decision for the core group of VNLA members who establish and develop the design for the Grand Garden Display. In today’s world of technology, with too much screen time and demanding schedules, it’s no wonder we forget the basics of taking care of ourselves. It’s no wonder we forget about wonder. Wonder is defined as a feeling of amazement and admiration or curiosity. Wonder goes hand in hand with beauty. As nursery and landscape professionals when we think of beauty we think of nature, from beautifully manicured lawns to greenhouses full of flowers to ecologically designed landscapes and handcrafted stonework. It’s no secret that connecting with nature has positive health benefits. Green spaces are now commonly found in hospital and office complexes. One of the hottest trends in landscape architecture is sustainably designed landscapes using native plants. Schools are incorporating gardening into learning because it’s an excellent way of teaching responsibility and healthy choices. These benefits extend beyond our own health, they help us to become more mindful and take better care of others and this wonderful place we call home. The wonderful thing about gardening as a way of self-care is that we can engage with it on so many different levels. No matter our age or ability we can experience a garden by simply being in it. Children have a remarkable sense of wonder about simple living things – a butterfly, a single blossom, a weed pushing up through a sidewalk. Throughout our lives we may experience challenges in our physical, mental and emotional health. Instead of feeling limited it’s important to remember we can find new ways to experience wonder. We can connect with nature by opening our senses to the scents, sounds and textures around us. It only takes a moment to bring our attention to this wonder but the joy from it can carry us far beyond that moment. We invite you to experience WONDER as you take the journey through the 2019 VT Flower Show Grand Garden Display! Gardens are wonderful places to relax and take time to reflect. Art is one form of reflection, and what better place for an artist than in a garden? Local artists have been invited to capture the beauty within the Grand Garden Display so keep an eye out for them as you walk through the landscape. Enter this haven from a noisy, tech-laden demanding world. Look around as the fragrance of the outdoor landscape permeates the air. Find wonder in how plants thrive in less than ideal conditions, growing robust and green in an otherwise hard urban environment. Continue on the path and you enter the Breathing Room, An indoor space filled with plants that oxygenate the air and promote relaxation. Experience the WONDERS of this garden space filled with indoor plants. This is an excellent way to bring nature into the home in more urban settings and during the winter in colder climates. Next, a transitional path leads into a fantastical woodland as standing trees give way to showers of tiny lights. As you continue on a Contemplation Bench invites one to sit and gaze at a simple garden feature. Deeper into the woodland magic abounds in the mysteriously flowing water of Lost Lake and various playful garden features. Wonderful color delights the eye in a powerful and balancing arrangement made entirely of flowers! Then in a more restful setting, standing stones invite wonder at landscape features from ancient times. Feel the different energy of these two places, both carefully designed of natural elements. Reach out and touch a velvety leaf or lightly crush an aromatic herb between your fingers to release its fragrance. Take a deep breath! Take time to experience this delight to the senses as you make your way along the path. Be sure to stop at the VNLA/Green Works pergola on the way out. Peruse the informational boards, learn about how the display came together and all the wonderful people who volunteered their time. Wondering what that plant is? Or how to make something wonderful happen in your garden? Visit with VNLA members and Vermont Certified Horticulturist and get your landscaping/gardening questions answered. Want to know what makes this so much fun? The people! The Flower Show Committee and Central Display Committee are a group of hard-working people who began the planning process 18 months ago. They have given tirelessly of their time and labor to ensure the show comes together in a few short days! Wow! Every show we ask master gardeners who participate in the UVM Master Gardener Program across the state if they are interested in volunteering their time to help with the Vermont Flower Show. The tasks are many and so are the master gardeners who come forward each show! Over the course of the week almost 100 master gardener volunteers help the VNLA with this endeavor! We gratefully accept their help and could not do it without them. Holding a flower show was the brainstorm of members back in 1963. Over the years the show has evolved, expanded, and grown into what it is today. That brainstorming by our members still goes on today. Many of our members donate their professional time and expertise to design and build the show. Others donate plants and materials. Vermont Flower Show would never be able to happen without our members continued efforts and dedication to bringing this show to life every other year. Hannah Decker, Fairfax Perennial Farm, Inc.